Its that time of year again and AfallaStudios is looking for a few high school seniors to help promote our business. What you get is amazing and will save you and your family tons of money on senior photos. No, you don't have to use the photographer that's on contract through your school who took your year book photos. Your senior photos should be something special that you can give to your family and friends. YOU have the right to use any photographer for your special senior year. Its a start of new adventures in life and now is the time to capture that in a timeless portrait. All you need to do is fill out our online form by clicking HERE. We'll review your application and then contact you to let you know if you are chosen. Simple! Then we will schedule your pre-session meeting so that we can find out what your personality is like and what kind of photos you're looking for. After the photo shoot, we'll schedule your post-session so that you can come to our studio and review your photos on our large screen display. At that time you'll bring Mom and/or Dad along to check out these amazing photos. We'll then place an order for your 50 Senior Couture Ambassador cards so that you can start handing them out to your friends at school. Marketing is key so we'll review how to approach your friends and get them in on booking their senior photo sessions. In addition, you'll then receive your iPhone/iPad/Android Senior Couture App so that you can start sending them out to your family and friends. This App shows off your photos where you can show off your pictures on Facebook, Twitter, etc. 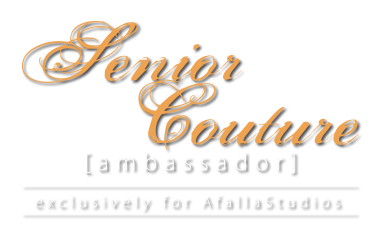 Why should I become a Senior Couture Ambassador? Being a Senior Couture Ambassador (SCA) will save you lots of money. Your typical senior photo session would usually cost anywhere from $99 to $300 from a local pro photographer. And that's just for the time the photographer would take your photos. That does not cover prints. Our packages start at $75 (in studio) or $85 (on location). In addition, we go that extra mile by giving you a 20% discount on all products like canvas wraps, albums, mounted prints, etc. So, why not apply and give us a shot at photographing your senior photo session. Click HERE to see what you get if you become a SCA.